Love these strings. The only ones I'll use for my flamenco guitar. Great output, great response with percussive techniques, and they last much longer than other brands. By far... They are so well balanced in tension, string thickness and sound. I use them on my Felipe Conde negra and Paco de Lucia Siroco blanca. Two different sounding guitars but the play-ability are the same. I've tried them all (Hannanbach, Belle, D'Addario, RC Strings, etc) and these are the clear choice for Flamenco. Next best choice is the Savarez Cantiga Alliance/New Cristal strings. These must be good with Weird Al Yankovic on the package. 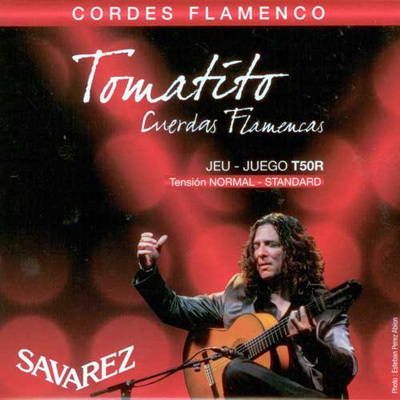 These strings bring life to your guitar, I own a cordoba f7 paco, a flamenco guitar and these strings with their normal tension sound the best, I recently switched to savarez and I have been amazed at the sound and most importantly the life of the strings, these strings and any savarez strings last an incredible amount of time, I use to murder strings and had to switch every time and with savarez I get a great sound and my strings can withstand the attack for a long long time, big ups to savarez! !